USA Handmade Beautiful Bolo Tie By Navajo Artist Mike Arviso | What Should I Say? 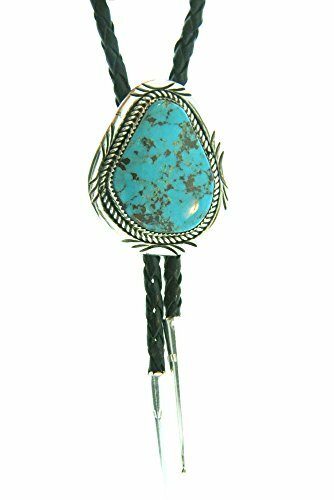 This bolo tie has a free form stabilized Kingman turquoise stone that is set in sterling silver with a stamped 1/2 round and twist wire border. It measures approximately 1 3/4" long by 1 1/2" wide at its widest point. If you have any questions about this product by Rich Peel, contact us by completing and submitting the form below. If you are looking for a specif part number, please include it with your message. USA made by Navajo Artist Wilbert Grey: Sterling silver Bolo Tie inlaid with Spiney oyster and synthetic Turquoise.